Loudoun’s Rotarians teamed up to help with the recovery effort in the Virgin Islands aftermath of category 5 hurricanes Irma and Maria. Representatives of five Loudoun Rotary clubs—Leesburg, Leesburg Daybreak, Purcellville, Ashburn, and Sterling—gathered at the Tuscarora Mill restaurant in Leesburg on November 14, 2017 to make the presentation. 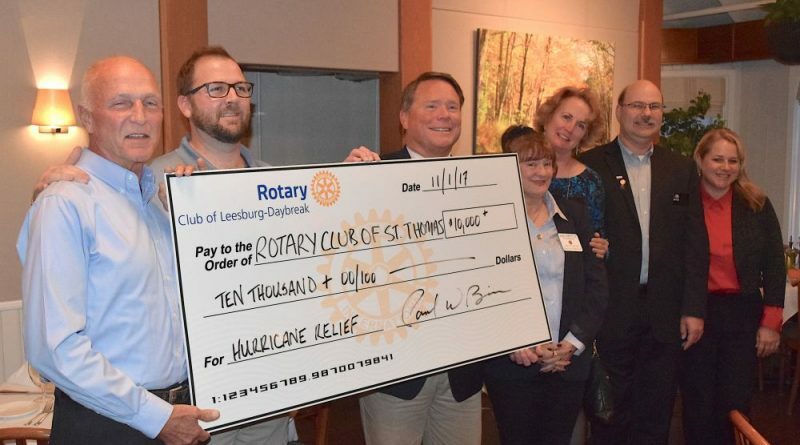 The $10,000 check presented to a representative of the Rotary Club of St. Thomas will likely be just the first step of Loudoun’s Rotary outreach.